Floreg strainer/isolator valve for controlled and even distribution when supplying multiple outlets. 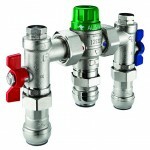 Whether your installation has you searching for a ball valve or check valve, you can rely on SharkBite for the highest quality brass valves equipped with SharkBite connectors for the ultimate quick connect installation. 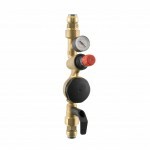 Our brass ball and check valves can be connected to Copper, Carbon Steel, PB or PEX pipe with no specialist tooling, heat or flux needed and as with all our products, every valve is assembled to the strictest quality standards. See for yourself why SharkBite is the top name in quick connect valves.